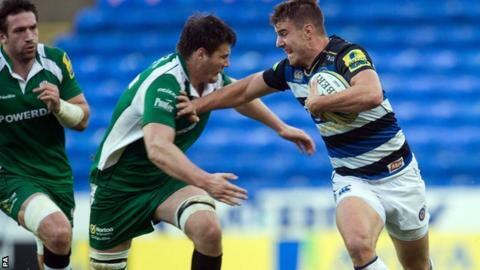 Bath ran in six tries as they made light of Sam Burgess's return to rugby league by beating 14-man London Irish. Wales international Rhys Priestland's early penalty, followed by conversions of tries for both Leroy Houston and Ollie Devoto gave Bath a 17-0 lead. Despite Irish scrum-half Brendan McKibbin's red card, Scott Steele's try whittled it back to 17-7 by the break. But Bath ran in four second half-tries from Alafoti Faosiliva, Kyle Eastmond, Priestland and Nikola Matawalu. Irish were always up against it from the 20th minute onwards after Australian scrum-half McKibbin was sent off for stamping on prop Henry Thomas's head. And their only second-half response was a try from Fergus Mulchrone 11 minutes after the break, also converted by Shane Geraghty. Former Exiles full-back Tom Homer, playing against his old club for the first time, then England fly-half George Ford took over Bath's second-half kicking duties. Homer converted the first two before Ford came off the bench to also get on the scoresheet by improving the last two. The fourth of Bath's six tries earned the visitors a bonus point as they recorded their eighth win in nine visits to the Madejski Stadium to hand the Exiles a fourth straight Premiership defeat. Along with Newcastle, who were beaten at Worcester, Irish are one of two teams at the foot of the table still seeking their first point. Bath confirmed on Friday that they had "settled on agreeable terms" to allow rugby league convert Burgess to return to the 13-man code and rejoin Australian side South Sydney Rabbitohs. The momentum appeared to swing London Irish's way in the 20th minute when Bath flanker Alafoti Fa'osiliva was yellow carded for a late tackle and the Exiles were awarded a penalty try. However, replays showed that in the build-up, Irish scrum-half McKibbin had stamped on Henry Thomas - for which referee Tom Foley brandished a red card and the penalty try was chalked off. The effect of the extra man was not immediately apparent as, within five minutes of Faosiliva's return, Ollie Devoto was then sin-binned too for a late shoulder charge on Shane Geraghty. But Bath raced out of the traps after the break when Fa'osiliva and centre Kyle Eastmond touched down within two minutes of each other. Once fellow centre Devoto had returned to bring the visitors back up to their full complement of players, there was no doubt about the end result. A first try for the club from Priestland after a strong diagonal run followed and, when Asaeli Tikoirotuma failed to deal with Semesa Rokoduguni's chipped kick, Nikola Matawalu finished things off. "I didn't have a chance to go back and view (the red card) closely so I'm not going to comment about what happened. "We're going to have to look at the discipline from our point of view. "I would have liked to have got a couple of bonus points from some of our losses but you have to be realistic about where we are. "I haven't come over here to sit around and lose. We've just got to be careful that we don't get ahead of ourselves. We're a team that has been under achievers and we're desperate to prove ourselves." "Myself and (captain) Stuart Hooper spoke to Sam Burgess on Monday. He said he would address the team and at no point did he mention he wanted to leave. "Whether I was naive or not I was hoping that he'd get through that week, but we never got that chance. "We're pleased after everything that's happened. We got some good tries from the backs and we're looking forward to Toulon now. "We couldn't handle their drive. The discipline of our defence was poor, and then the turning point (McKibbin's red card) was massive. That turnaround is good fortune for us, bad luck for them." London Irish: Ojo; Lewington, Fowlie, Mulchrone, Tikoirotuma; Geraghty, McKibbin; Smallbone, Paice, Halavatau, Skivington (capt), Symons, Guest, Sisi, McCusker. Replacements: Ellis, Court, Aulika, Sheriff, Narraway, Steele, Noakes, Waldouck. Bath: Homer; Rokoduguni, Devoto, Eastmond, Banahan; Priestland, Cook; Auterac, Webber, Thomas, Hooper (capt), Day, Garvey, Faosiliva, Houston. Replacements: Dunn, Catt, Lahiff, Ellis, Northcote-Green, Matawalu, Ford, Williams. Sin Bin: Faosiliva (18), Devoto (33).